In our guest post series, we invite alumni, staff and current students to reflect on their time with the VCA. Here, sound designer and research student Kahra Scott-James reflects on her decision to undertake a research degree at the VCA. Kahra is trained in journalism, film/TV production, and audio with an MA (audio) from The University of Westminster, U.K. She has been involved in the media, arts and entertainment industries for several years, primarily broadcast, film, digital media and animation. Since 1997 she has specialised in audio production with a specific focus on sound design, music and audio post. She managed an audio studio for several years with credits ranging from short films to features, interactive movies, television series, animation, commercials, documentary and games. Kahra currently teaches audio post (JMC Adacemy) and has lectured in film sound, music video production and sound design for animation/games. She has also worked in teaching and technical support across film, video and sound (New Zealand, Australia, Ireland). Graham, Paul and Kahra having a beer (after a hard day at the office). 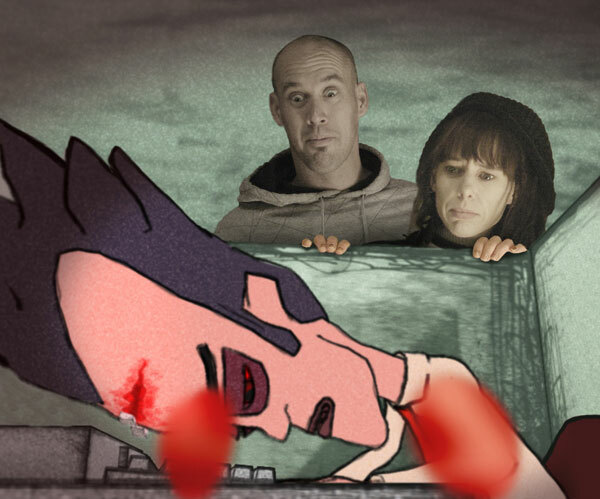 Short Film ‘Graham’ has won awards in the New York Underground Film Festival (USA) and the Stuttgart Festival of Animated Film (Germany) – Bitfilm Award. Her work has screened in a number of international festivals including the Nordisk Panorama Film Festival (Denmark), Gulf Film Festival (Dubai), Zebra Poetry Film Festival (Berlin), International Exhibition of Video and Moving Image (Spain), Annecy International Animated Film Festival (France), Hamburg Animation Festival (Germany), and the New York Underground Film Festival (U.S.A.). Recently she has had two films selected for the New Zealand International Film Festival and Palm Springs International Film Festival, U.S.A. Kahra has also been selected as a Judge for the ATOM Short Film Awards 2012. The path to the VCA resulted from a conversation with a colleague. I had been contemplating a particular problem for a while and felt the only way to tackle it was through research. It was suggested I contact Roger Alsop. I emailed him a draft proposal, we met, and after an interview I was accepted. Having worked for a variety of institutions and companies I have a preference for smaller organisations. The VCA seemed like a relatively compact school, with the advantage of being a part of the University of Melbourne, and having a research focus. My field is sound design for motion picture, which incorporates film, animation, broadcast and digital media. As these are collaborative fields I wanted to be in an environment that housed the various art forms. My research problem stems from working in industry and issues around interdisciplinary collaboration. I felt it would help to be in an environment with a diverse body of creatives. Kahra playing drums in a music video for ODD. The main practice component of my research is the production of an animated film. I’m also developing a live performance, which involves drumming, sound effects and film. It’s something that ‘clicked’ after finding a paper that touched on film sound prior to synchronization of sound and image. Drummers drummed and played sound effects. So it seems like the perfect way to discuss the birth of sound design. Luckily I am a drummer (I’d probably lose an eye otherwise). At this stage I’d say it’s early days, and for the most part I have been focused on laying a foundation so that I can move forward. I think the combination of research and creative practice will lead to some interesting developments. My cohort is an eclectic bunch, so I’m looking forward to seeing who does what along the way.